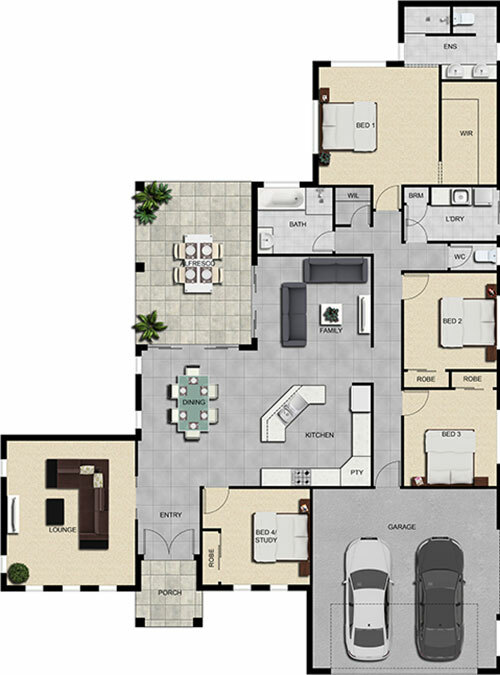 A spacious design for the larger families looking for their own space. The open plan design ensures the kitchen, dining and family areas look out over the undercover rear entertainment patio. The kitchen is the central hub of this home. All bedrooms and the family bathroom have been positioned to the one side of the home with the master at the rear of the home. The master incorporates a stylish en-suite and large walk-in robe. The lounge/theatre is situated at the front of the home away from the main living areas. The images supplied are to be used as a guide only and may represent non-standard options. Prices are subject to change.